Until three weeks ago, I’d never played mini-golf with wheelchairs. My childhood was filled with many good times at the sport: my mother cackling when she got a hole in one, my brothers sparring when one hit the other’s ball, knocking it out of contention, and endless laughing. As the youngest of four, I learned how to lose without crying. We sometimes threw out the score sheet when things got too ugly. We learned about healthy competition and cooperation, giving advice on how to make it past the deadly windmill or waterfall, always ending with an ice cream sundae or a chili dog. They were good times, and we never worried about how silly we looked because everyone looked silly. So, going out with Timebankers to play mini-golf seemed like a fun thing to do on a Saturday, but not monumentally important. It was arranged by Sarah (not her real name), who lives alone but has close ties with family in Maine. Sarah has post-polio syndrome, diabetes, and a host of medical conditions that would fill a novel and confuse many a doctor. 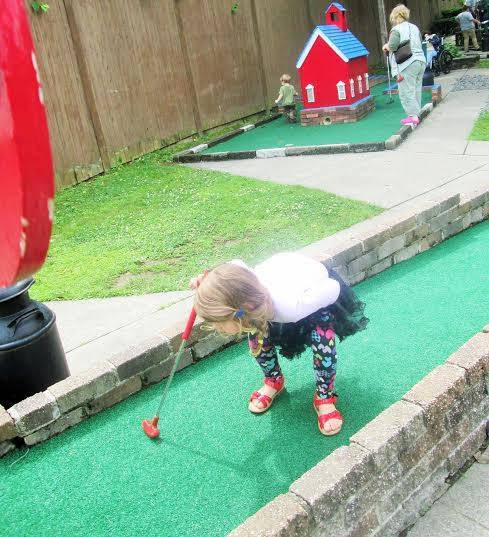 She is dependent on a power wheelchair to get her around, which is one reason we picked mini-golf, because it is just around the corner from her and it has a nice ice cream place with lots of flavors, including low-sugar options. Her daughter, son in-law, nieces, cousins and other family came with us, some unofficially adopted when they fell on tough times. Her family was always inclusive to whoever needed help, taking in stray children like cats. They certainly felt like family to me, maybe even more so, because my family doesn’t understand why I chose to lead a Timebank and work without cash involved. In the Timebank, everyone loves me without conditions. I brought another Timebanker with me to join the family—we’ll call her Anne. Anne is also in a wheelchair, due to cerebral palsy and scoliosis, living at a residential care facility. She is a tiny thing, told by many a doctor that she would never live past her twenties, yet here she is at age 53. Her family life until now has been filled with pain. Most of them no longer even speak to her, considering her persona non-grata, denying her very existence. Their loss—she is a beautiful person filled with love for all creatures on this Earth. Her daughter is the only one who ever calls her but usually ends up asking for money, not comprehending that her mother now lives in a facility and receives only $40 in free cash per month, the rest going for her care. It was a sun-filled afternoon in July, the sky a singing blue that only occurs when the air breathes from Canada, clean and dry; I pray every day for that air, threatened by unbridled capitalism and unrelenting thirst for tar sands sludge. I wonder if other Mainers know how fragile that blue sky is, and how it brightens crossing the state line at Kittery. My heart always leaps when I see “All Maine Points” centered through my windshield. As a child growing up in the San Fernando Valley in California, I stared in awe at the blue sky when we first visited Maine, looking for a home. It had always been a hazy green for me. And, once in Maine I could run great distances without breaking down in a fit of coughing. The air in Maine is my life breath. After the game, we enjoyed a dizzying array of sweet delights from the ice cream stand. Sarah found a frozen yogurt with berries and no added sugar, to her contentment. As the light began to slant at the end of the day, we all glowed, hugged, and said our goodbyes. I drove home with Anne, basking in the day, thinking about all the times I had played the sport but never in this way, and of families that have enjoyed mini-golf together, knitting them in a way that no video game can. Anne was bubbling with joy, saying she’d never had more fun in her life, and that she felt like part of the family in a new way, not just as part of Sarah’s family, but the whole Timebank. I spoke a little about other mini-golf parks I’d visited, from the indoor black lit course on Prince Edward Island to large courses in California with elaborate dinosaurs and trick shots. I am in love with Anne and Sarah, her family, my family for showing me love, and my Timebank for showing me the importance of Good Work. It is what drives me to keep building networks and keep meeting new people, and finding new ways to connect as family. Family is an institution that is under siege. We hurt our families when we put them in terms of money. If we can think so little of family members because they are not valued in the marketplace, if we can think of our sisters, brothers, and daughters as less than human, what will stop us from thinking the same of our neighbors, community, nation, and the needs of our planet? As a species, without consideration of our family and the assets we ignore, we are doomed. If we continue to live without regard for others, we will all suffer. For me, Timebanking is about ending that suffering, of building the family from within, of creating beauty. I do it in the name of love–unconditional love. When I think of Timebanking, my heart soars; that is why I continue, and why I play mini-golf with wheelchairs. Thank you for the stories that tell about TimeBanking; this one showed the connection between people and that is a huge part of why I love being a Timebanker. We all need to feel like we belong and this story was all about belonging to family and to friends–as well as the bond that comes when we connect through others. When people are cut off through trauma or disability they feel isolated, and when ones’ own family does not even want you around, that leaves a huge hole that Timebanking can help mend. This story was rich in love and family and the connections that bring us together. For those of us who were raised in a family that encouraged us and cared about life and love, it is hard to comprehend the isolation that so many members of our community experience. They hide it behind smiles and nods and try to keep the pain from showing. However, if we connect through Timebanking we will soon see the person behind the smiles that is kept hidden; that’s when the connection between people changes lives. This is one of so many stories, and yet it’s the stories about the lives that are changed that make Timebanking so powerful. This story really touched me because I too have seen Timebanking change lives, including my own. Not everyone has the gift of storytelling so I appreciate this, because I think it’s fast becoming a lost art. It’s important we encourage the stories that show how Timebanking changes individuals and Communities. Thank you, Stacey, for sharing this story about love, mini-golf and Timebanking; I hope to see more stories in the future.